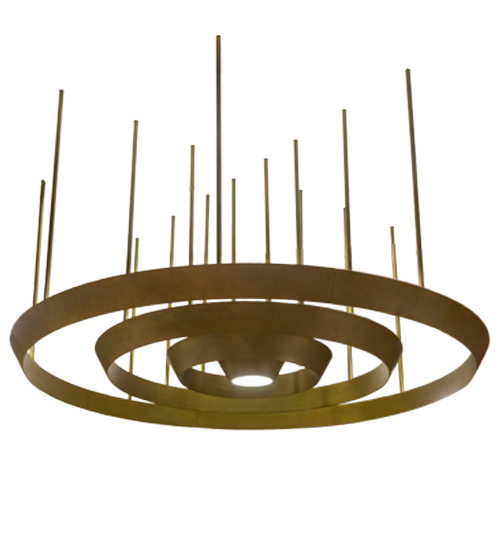 Description: Inspired by the Deco styled engines engineered to propel rockets in vintage sci-fi adventure series, this handsome chandelier features three tapered rings surrounding a downlight which results in a unique intergalactic look. All of the rings and matching hardware are featured in a brilliant Statuary Bronze finish. The fixture includes integral LED uplights and a Clear/Frosted bottom Glass diffuser. Ideal for residential living spaces, conference rooms and lobbies of entertainment companies, hotels and other commercial spaces. Custom crafted in the USA, this luminaire is available in special sizes, finishes, colors and dimmable energy efficient lamping options such as LED. UL and cUL listed for damp and dry locations.